You can double or triple your contribution to the Chabot PTA by taking advantage of your corporate match benefit. Many companies, both large and small, will match donations made by their employees. Some companies even match gifts made by retirees, family members, and friends of Chabot PTA! 1. What are Corporate Matching Gifts Programs? Corporate Matching Programs are employee giving programs in which the company matches donations made by employees to eligible nonprofit organizations, like Chabot Elementary. It’s an easy way to double or triple your contribution to Chabot! Corporations match cash gifts such as donations to the Annual Fund or Raise-The-Paddle cash donations from the Chabot’s Spring Auction. In addition, donations that exceed the face value of items purchased at the Chabot Spring Auction are also eligible for corporate match. 3. When should I request the Corporate Match? We recommend requesting the matching gift as soon as the donation is made. Some employers have time restrictions of 2- to 6-months, while others allow a 12-month grace period from the time of the donation. This information is often provided on the Corporate Matching Search results above. 4. How can I help more? Do you know other Chabot parents who work at your company? If so, become a Corporate Match Parent Partner. Reach out to the Chabot parents at your company to let them know about your employer’s matching program. 5. What if I still have questions? For questions regarding your company’s programs, please contact your employer’s HR or community giving department. Information may also be available on your company’s intranet or the links provided in the Corporate Match Search above. 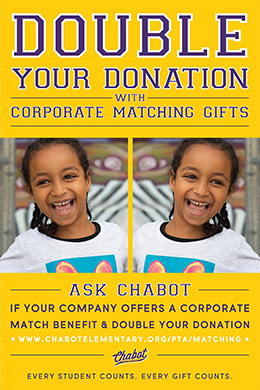 For questions regarding submitting a matching gift request to Chabot, please contact the Chabot Corporate Matching Leads Shirin Belur and Lina Sheth at corpmatch@chabotelementary.org. PTA California Congress of Parents Teachers & Students Inc.